The current downturn in Oil & Gas serves as an important reminder that things are always changing in our industry. Things are never static. As engineering marvels are achieved out in the field market conditions are changing back home by the hour, inevitably determining what challenges will be taken on next, and which ones will be left in limbo. And then there is the technology supporting our engineers. Equipment, data and analytics…things are changing in Oil & Gas technology at a rate faster than ever before. The cost of operating a drilling rig by the day has dropped a lot compared to only two years ago, for example, allowing us to push the boundaries of where we go and how much we extract. In an industry of constant change we need to do what we can to manage uncertainty, to consider our everyday operations in this environment of constant flux verses the traditional approach of considering them in more of a static bubble, where we can only reasonably predict the future. The fact that cost overruns are inherent in Oil & Gas immediately places the traditional approach to planning in doubt, but fortunately mathematical and software tools are available to help companies position themselves to succeed in environments of uncertainty like now. Genesis Petroleum has been creating software, combined with an analysis methodology developed for well operations and a Knowledge Base, to generate a reliable level of predictability in planning operations for our clients. It is also use it to measure and evaluate performance over time. It is this enhanced ability to predict operational performance that produces the best distribution of allocated funds to competing projects, and maximizes the return on invested capital, contributing to maximized profitability and NPV. 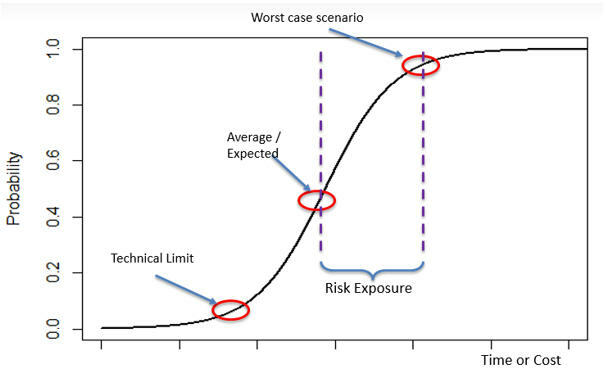 It is important to note that predicting does not mean avoiding the risk or preventing its impact though, but rather it is about recognizing its probability and guaranteeing decision-making conditions in order to keep the effects at acceptable levels for the business. In our line of work ‘predicting’ means maintaining dynamic processes to analyse, develop, document and maintain different scenarios. One of the most important aspects in the development of an oil field is the analysis of the operational sequence of an intervention in a well, whether drilling, completion or workover, for the duration of the intervention and its impact on the budgeted cost, represented by the AFE (Authorization For Expenditure). It may come as a surprise but it is still a common practice in the industry to estimate AFE deterministically. That is, without taking into account the full range of events that could change the outcome. This isn’t to say the traditional method is wrong, but it can pay dividends to have degrees of risk where traditionally there is a fixed, limited vision of what lies ahead. Gut feeling or intuition can only take us so far, too! Given market forces and exchange rates can change dramatically over time we cannot use previous AFEs as a statistical base for reliably determining future AFE. In an operating environment constantly fluctuating there actually is something that remains the same, though: time. Exploiting this fact gives us a way to predict future performance in an environment where almost everything else could be considered unpredictable. So rather than producing an AFE deterministically the basis for AFE should be related to ‘time’, as 24 hours per day is the same in 2016 as it was in 2015 – it is invariant. Therefore, statistical AFE should consider the probabilistic variance of time multiplied by the cost items that are time dependent. Time variance can be obtained by carefully using historical data. This produces a sound probabilistic AFE, which finance personnel can use to assess their risk exposure for the project. That is, how much the AFE can be in the worst case scenario due to time overruns versus the average or expected scenario. Companies can’t see the future, even with mathematics and analytics, but they can certainly manage and prepare for it! Studies that helped shape Genesis software showed deterministic AFEs demonstrating differences of 20% to 35% between the actual cost and the planned costs of drilling operations. While every situation is different, when we consider the enormous budgets allocated to drilling activities a cost difference of 20-35% could be staggering, in any context. The current downturn is tough for everyone involved, but no other time demonstrates the case for managing uncertainty with a probabilistic AFE better than now. In a time of limited spending in an uncertain economic climate, reliable and informed risk exposure assessment can certainly make or break projects.